In the last few weeks, both the new DHIS2 android app and the tracker capture app have been crashing when we sync or try to register a TEI (see screenshot). We have updated the apps, uninstalled and reinstalled from the play store, and updated the devices. It is happening on multiple types of devices (tablets, phones) both in the field and in the US. Is anyone else experiencing this, and any thoughts on what we can try? Also, we noticed that some of the DHIS2 apps now say (dev) at the end – what does that mean? just posting ere the conversation from launchpad. The (Dev) suffix was removed last week. For the crashes, would you mind sharing testing credentials to your server to check the problem? We would like to make sure that is not a metadata problem since it is crashing in both apps. Hi @marta, was this ever resolved? We are having the same issue, and, because of it, our teams in the field have started data collection on paper again. I`ve seen you posted this in two places and now I am confused of which app is actually crashing, since this post belongs to old app, and the other one to the new one. Please test the new app to be released today and let us know how it goes, or if you need the old one, then please share details of the crashes (version of android, version of the app, device, version of dhis2…). Hi! The new app is awesome, we love the interface, but it’s still crashing all the time with one particular tracker program (unfortunately, our primary program)! Particularly when we are in the process of registering a new TEI (like after the OU is selected but before the data entry screen loads), but occasionally at other times as well. One clue is that I can register a TEI in a different tracker program and it works fine, but then when I try to add the main program enrollment to the existing TEI, it crashes at that point, so it seems like the problem is mainly with this one tracker program. Can you think of anything we can try? Might it be related to the volume of TEIs in the main program? (around 50,000, obviously not on the devices) Any settings we could try changing? Anything with the metadata? It’s happening on all the devices. Also, on another note, can you think of a reason that program rules would work on the browser but not in the app - specifically, autopopulating the age based on the DOB. Thanks for any help - we are rolling this out early next week to our community workers. We can have a look if you don’t mind sharing your testing server URL and a testing user credentials. If so, please send them to @Pablo (ppajuelo@quadram.mobi) and me (marta@dhis2.org). I see we alrady have the testing credentials to your server. If they still work, then we just need some details on which program is actually failing. Thanks Marta! I sent you the information and will also be ready to document general solutions here so everyone can learn. Hi, just as an update, we rolled out other new programs with no TEIs registered, and they are also crashing the app, so I don’t think it has to do with the volume. It is working on the old tracker capture app (we can register TEIs in the new programs). 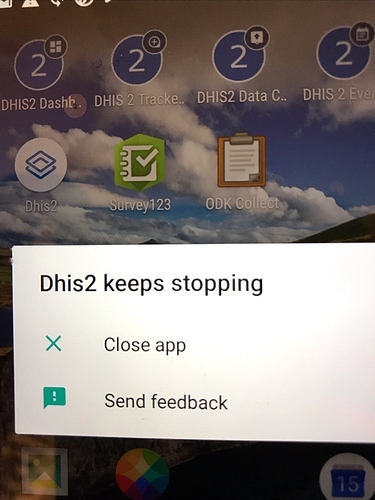 The users MUCH prefer the new DHIS2 Capture app interface though, it is sooo much better, so any help making the new app work would be amazing. Right now they are using paper.